Happy Thanksgiving, everybody! Yesterday we made full use of our seven microwaves for our annual potluck. The team has been cooking in our kitchen since Monday, which is great unless you have the closest desk to the kitchen and have been smelling turkey all week. Get in my belly! Have I mentioned I've been here a little over three months? The Rockwell Automation Fair was like being baptized in the fire of our industry, although the NFPA would advise against that metaphor. They all warned me, they said it would be crazy, but nothing could have prepared me for the scope and scale of the Automation Fair. Promo items disappear at a moment's notice. Seriously, I just put out 25 flashlights, where did they go? 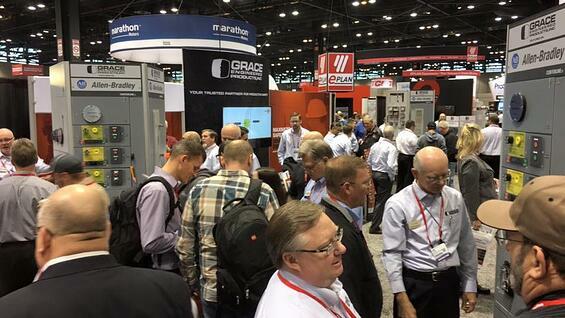 Nearly everybody who came through the booth has heard of GracePorts or even have them installed in their facility. They also love the fact that they are fully customizable, down to printing their own logo on the faceplate. People tend to be more unfamiliar with the IR Viewing Windows and from the people I spoke with and heard about, they're widely using open-door infrared inspections, which presented a great dialogue opportunity for the convenience of IR Windows. The new booth layout eliminated the confusion of branding for SafeSide & GracePorts all being under the same roof, Grace Engineered Products, and the towers were a thing of beauty! Four identical towers with five sides featuring our working products, as you can see from the photo. This helped everyone explain who we are and what we do as quickly and efficiently as possible, which is nice, considering there are ~18,000 people walking around the expo center. Lastly, if you're the newest guy in marketing, be sure to befriend a sales rep and keep them close for the inevitable engineering/technical questions you don't even have the slightest clue about yet! I'd like to personally thank all of you who stopped by the booth and talked to me about HUMPDAY. That meant a lot and it was beyond cool to meet you all in person. I inherited this beautiful blog from those who built it from the ground up over the years and I am so happy to be a part of it and I'm glad to hear that you are too. So that's what I'm thankful for this Thanksgiving! Just one week before experiencing an arc-flash incident, a manufacturer installed arc flash relays that helped save $1 million plus worker injuries. Discover how arc flash relays help the plant escape devastation. Happy Thanksgiving, everybody! 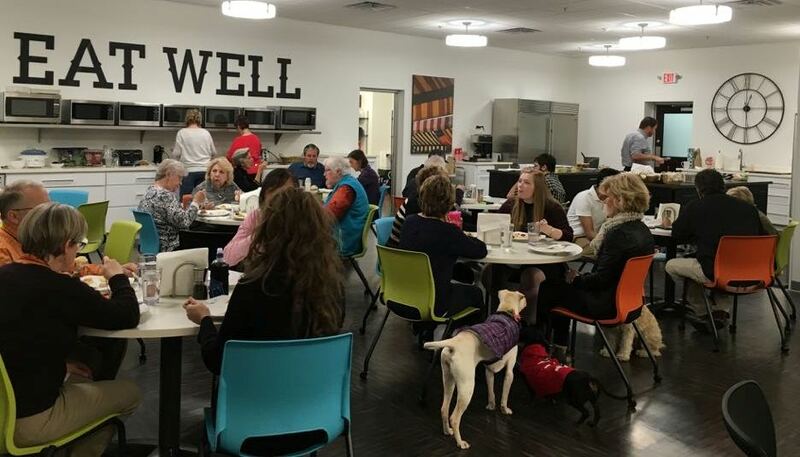 Yesterday, we had our annual Thanksgiving potluck. I'm still full. 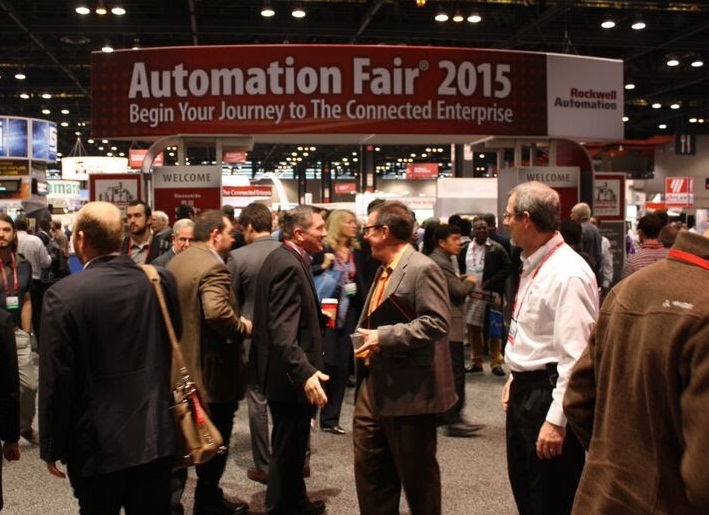 Automation Fair was an incredible and rewarding experience. Our new booth was extremely well received by both our customers and sales reps alike. Communication and demonstration were made simple thanks to the fully functioning towers and displays. Grace Engineered Products will be closed for the Holidays on Nov 26 and 27.